Are you a hungry pregnant mom who needs more energy? Are you trying to have a healthy pregnancy? 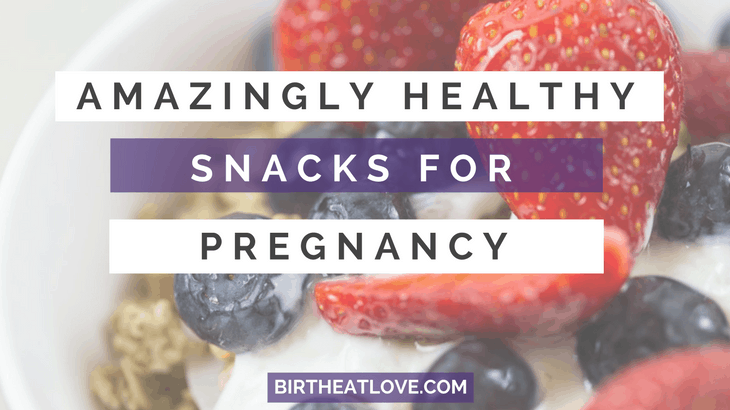 There are lots of real food, healthy pregnancy snacks that can help you curb cravings, boost nutrient and give you more energy. Snacking can be good for you when you choose your snacks wisely. 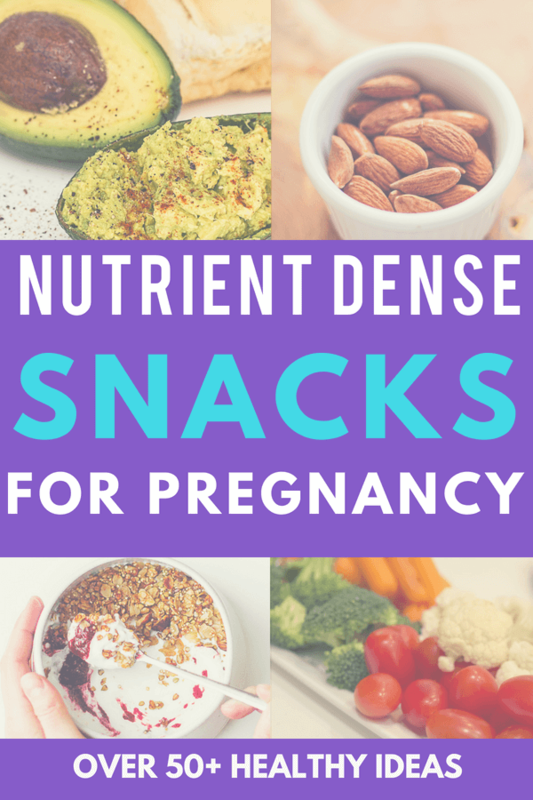 This list of healthy snacks for pregnancy is based on nourishing, nutrient dense foods so that you can snack without the guilt. During pregnancy you need to eat A LOT to grow a healthy baby. Eating snacks 2-3 times per day is a good idea to help balance blood sugar and boost energy. 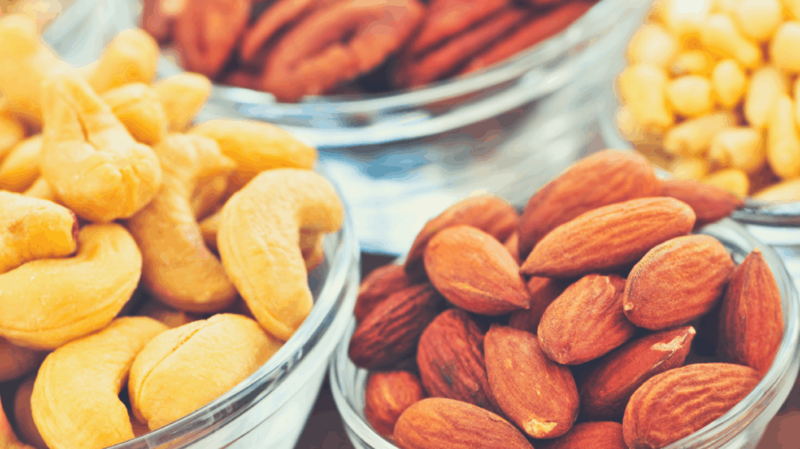 Nutrient dense snacks can give you the extra boost you need. Many of the snacks fall into multiple categories! The best effort has been made to arrange them appropriately for quick reference. The focus here is on real food snacks that are easy to prepare. Stocking your fridge and pantry with the healthiest foods will make it easy to choose wisely. 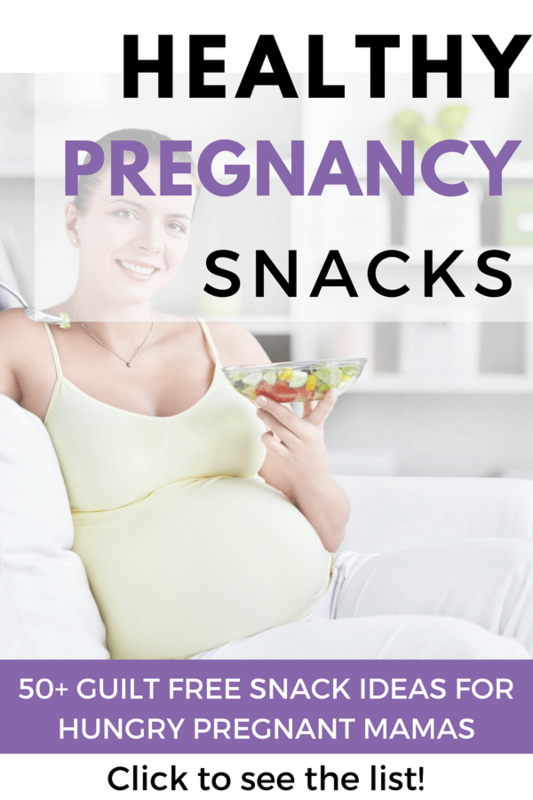 This list of healthy snacks is not just for pregnancy though! It is also useful for postpartum, breastfeeding and busy mom life. Eating nourishing snacks is a habit that all moms can use! Make sure to PIN this post for later so that you can come back when you are in the need for some snacking inspiration. Keeping your blood sugar balanced is important during pregnancy. These low glycemic fruits can be good choices for keeping gestational diabetes under control. During pregnancy you need extra protein. Boost your protein and get extra energy with these snack ideas. Have low iron levels during pregnancy? Boost your body and avoid pregnancy anemia with these iron rich snack ideas. 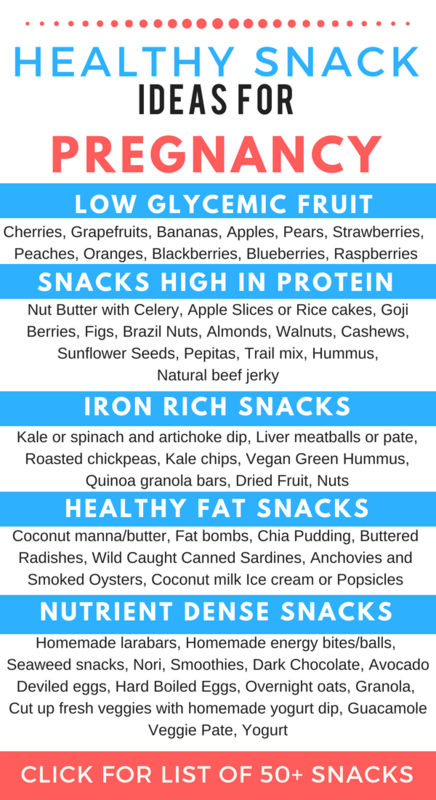 All of these snack ideas have a variety of nutrients and superfoods to help you grow a healthy baby. Homemade larabars – These Coconut Cream Larabars are fantastic (I made them for my last labor) ? Yogurt – Greek or homemade with toppings hemp seeds, flax seeds, chia seeds, granola, fresh fruit (banana, blueberries, strawberries, peaches, etc.) Eat alone, as smoothies or in smoothie bowl. Use raw honey or pure maple syrup as sweetener. 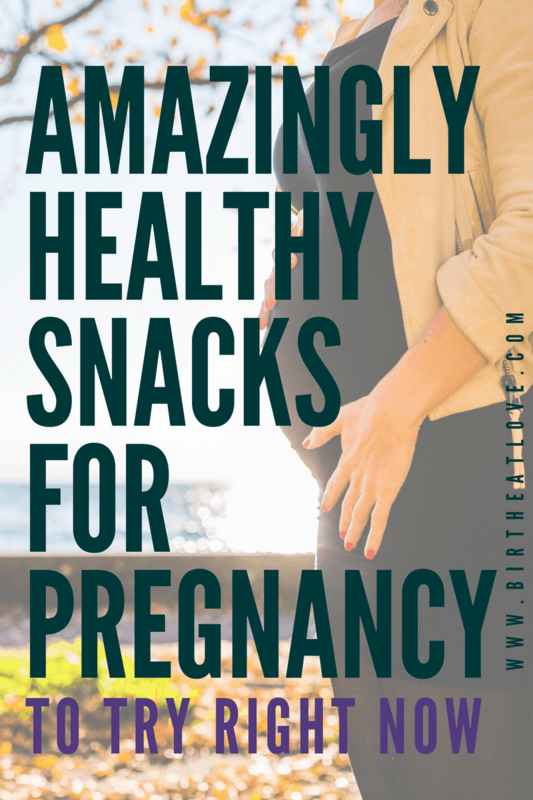 All of these healthy snacks for pregnancy help to boost your healthy fats such as Omega 3’s. Fat bombs – made using coconut oil or grass fed butter these are more like a dessert that’s good for you. Buttered radishes with Kerry Gold butter – seriously good way to get in healthy fats! Ice cream or popsicles made with coconut milk – this snickerdoodle caramel ice cream also has date fruit which can help with an easy labor! Now that’s A LOT of good food to fill your hungry belly! What are you snacking on? Share with us on the comments below or with the hashtag #birtheatlove on Instagram! Figuring out what to eat for a healthy pregnancy doesn’t have to be stressful! Join the Birth Eat Love Community below for resources to have you eating well and feeling your best! 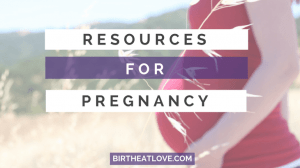 The Ultimate List of Food for Pregnancy and Breastfeeding – food to stock up on before baby! Save this post for later! Click the Pinterest button to see additional images to pin! Healthy Eating gluten free, healthy eating, pregnancy, pregnancy food, pregnancy tips, snacks. permalink.